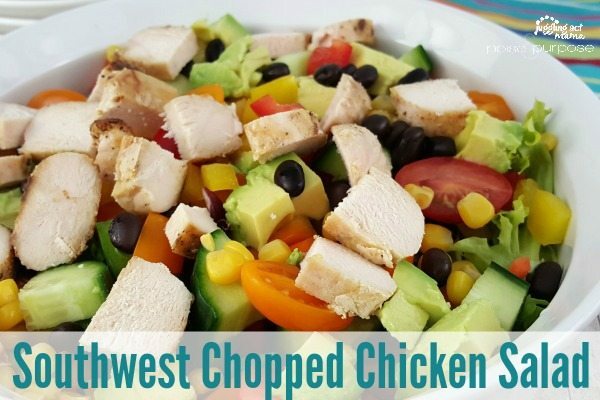 This Chopped Salad Recipe is a cinch to make and packed full of big bold flavors, especially when topped with homemade Southwest Chipotle Dressing! 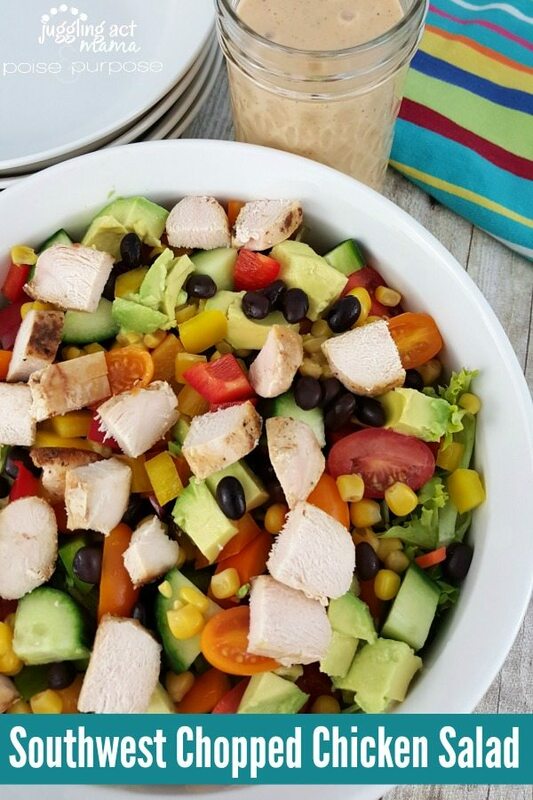 Our Chopped Salad Recipe is hearty, flavorful and just perfect with our Southwest Chipotle Dressing! Finding delicious dinner ideas sometimes feels like a full time job in itself. (I guess as a food blogger, it is kind of my job!) I made this Chopped Salad Recipe the other day for Mr. Juggling Act and it was a huge hit. It doesn’t matter what kind and long as they are loaded with lots of tasty toppings. (Although it should be said that he’s not a big fan of what he calls “frou-frou lettuce.”) This easy salad has all the great flavors he loves in one delicious bowl. When he came home from work and saw this on the table, his eyes lit up! Note: I love buying my spices in bulk via Amazon Subscribe and Save. It saves me time and money and since I make a lot of my own rubs and seasoning blends, I go through them fairly quickly. There’s so many great flavors here with the cucumbers, tomatoes, avocado, corn and black beans. It is topped with grilled chicken and my Southwest Chipotle Dressing. And it is so very good. Sure it’s just a salad, but it’s a salad that eats like a hearty meal. It’s loaded up with protein so it will keep you full longer. 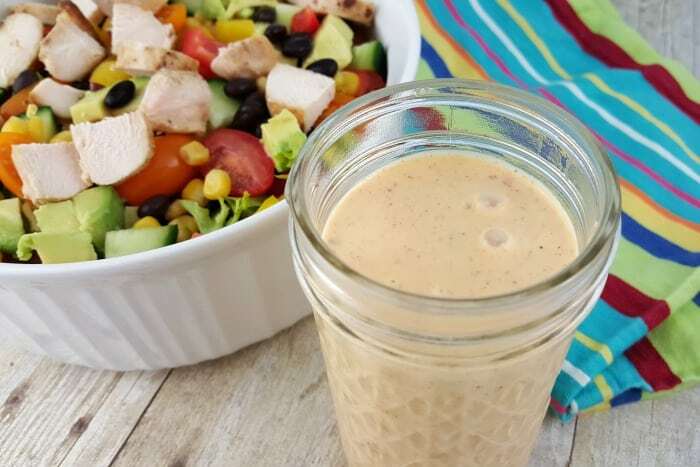 This salad is full of beautiful fresh veggie, tender grilled chicken, and topped with a tangy Southwest inspired dressing. Season the chicken breast with the fajita seasoning mix and grill 5-6 minutes per side. Set aside while you assemble the salad. In a large bowl, combine the greens, bell peppers, cucumbers, and tomatoes. In a small bowl, add the flesh of the avocado. Squeeze the lime juice over all of the avocado and toss to coat. Add the avocado to the salad. Chop the chicken and add that to the salad. Serve immediately with Southwest Chipotle Dressing. In a small bowl, whisk together the ingredients until combined. Store left overs in the refrigerator in a mason jar. If you enjoy cilantro, you can add it to the dressing (or the salad). If you’re a salad lover, you’ll adore the bold flavors in this chopped salad recipe. It’s hearty enough to eat as a meal, and you won’t be snooping around the kitchen for a snack a half hour later! I hope you’ll give it a try soon! Because we test all our recipes, we recommend that you make them once just as it is without substitutions or changes. Sometimes variations can go awry. Making slow cooker beef and broccoli recipe as we have tested it will yield the best results. If you really want to get creative, here are some ideas for variations that might work well. (Please note, we have not tested these variations). Add a drizzle of balsamic dressing and extra virgin olive oil. Season with salt and pepper, to taste. Looks good! But the link isn’t working for me. Hi Gene! We have updated this post with the recipe here. Enjoy!